November 25, 2016. We missed this one - Silver Sage was sold March 25, 2016. Still waiting for the new owner (Robert) to check in. March 2, 2016. We got an up date from Brian. Silver Sage is For Sale. contact is agent, Guy Le Roux, (361) 882-7245. Dolphin 24 built by Yankee Yachts, hull number 100 for sale. This venerable design was design #1497 from the catalog of the renowned yacht design firm, Sparkman and Stephens. Famed designer Olin Stephens was quoted saying that the Dolphin 24 was, "One of our best designs". 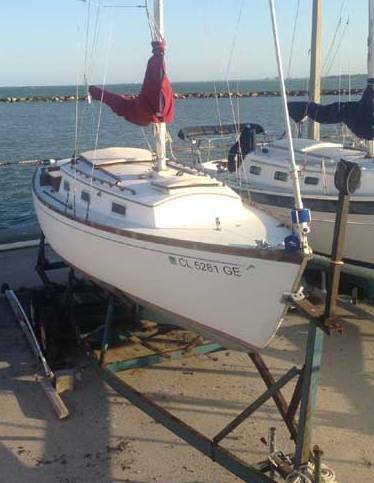 >Shoal draft keel-centerboarder with 2' 10" draft (board up) and 5' 2" (board down). July 15, 2011. Brian Nilsson checked in as the new owner of Yankee #100. His email is below. We are standing by for more information about See Ya Sooner, and some pictures. I'm Brian Nilsson, new owner of Hull #100, "See Ya Sooner" ... bought from Chris Brown in Taos, New Mexico. I signed up for the newsletter, and would like to be added to the Members roster for the website. I'll also register for the forum and fill in the info, but I didn't know if I needed to be official first? Anyway, looking forward to the association with other owners. 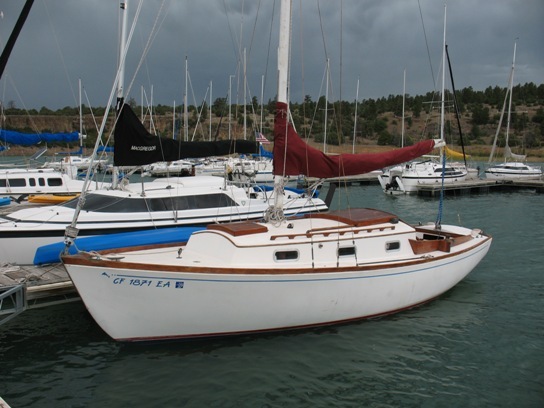 Here's a pic of my #100 in water at Heron Lake, at New Mexico Sailing Club Marina ... I must say she's the sexiest boat in the marina. July 28, 2011. Brian's been working hard as his picture above indicates. 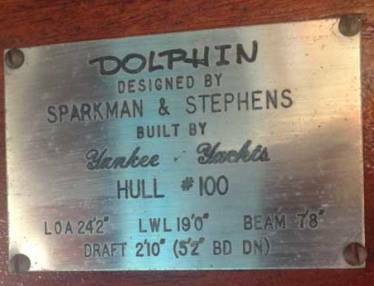 Yankee #100 is also a good example of the work that our tireless Dolphin Field Investigators (DFIs) do. We first found out about this boat in November, 2008. DFI Brian Henderson started it off with a field report (minor edits). The continuing trail of discovery is below. And, #100's new owner also joined the ranks of DFIs with a report locating two previously unknown Dolphins #142, and #152. Click on the hull numbers to go there. My name is Brian Henderson; I have a DeFever 38 in Marina Cortez, San Diego. Delphinidae is a couple of docks down from me. I have always admired the Dolphins and wish I could fit in one, but I just don't think a Dolphin is in my future as I am a large, stiff jointed old guy. Nevertheless, I am currently on "vacation" in San Carlos, Mexico (a resort area just north of Guayamas, Sonora) and have spotted a couple of Dolphins. One is hull # 100 owned by Tom and his wife, whose name I do not remember. It is docked three boats down from the guest dock I am staying at (on a friends boat). I talked to Tom and he should be reporting in to this site with some info on his boat, so I will say no more about it except to say that it is a very nice and clean looking little boat.
" a BEUTIFUL little SailFar -style boat An S&S design 1969 vintage Dolphin 24 with a centreboard, trailerable." "The owner I met and sailed with is named Chris. He bought the boat in San Carlos a few months ago I think. He's based in New Mexico. Nice guy too." So it seems that Tom and his wife sold the boat to Chris a few months ago. Someday, we have to get Chris to check in. Stay tuned...BTW, this San Carlos is the one on the Pacific Coast/Baha. Ron...I am the Chris that now owns Hull #100. I ran across the entry that you hoped I'd check in. I now have her in Taos, NM. Her Name is See ya Sooner. Thanks for the earlier info. You were right, the major leak(s) are in the cockpit drains, which I'm replacing. I am now in Corpus Christi, TX, with the boat and have renamed her "Silver Sage." 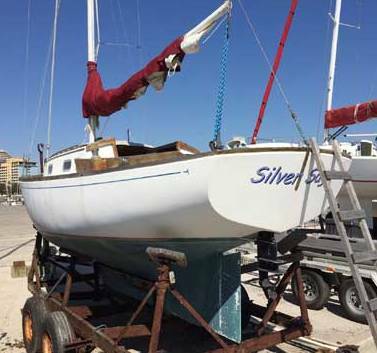 I will have her at the Corpus Christi Marina and plan to get her sailing in the next couple of weeks. Yeah, it has been awhile. I'm here at my ranch, Silver Sage, North of Taos, New Mexico. In summer its cool here. I go to Corpus Christi and sail "Silver Sage" in winter. ... Works out.